It's hard to believe it was less than a week ago that I wrote Own The Podium Should Have Under Promised and Over Delivered. It had become apparent that our total medal count was going to be much lower than the United States' and we were going to fall short on our pledge to "Own the Podium". I felt our athletes were being unfairly blamed for under delivering on Own the Podium's overly ambitious promise to "place first in the total medal count at the 2010 Olympic Winter Games". That was six days ago. Everything's different now. Canada finished so strong, delivering the most desired of medals when Crosby scored the golden goal. That was gold medal #14, the gold medal that set a winter Olympics record and sent this nation into a delightful frenzy. Let's take a look at the final medal count for the 2010 Olympic games in Vancouver. As mentioned, that 14 gold medals Canada won is the all-time record for a single nation at any winter Olympics. Of course, that also means we smashed the record for a host nation, despite never winning a gold medal during our previous two Olympics in 1976 and 1988. That 14 gold medals is 4 more than the 2nd place country, Germany, and 5 more than the country with the most total medals, the USA. 14 gold medals is, without a doubt in my heart and mind, evidence of podium ownership. Top rung, baby. OTP can define it however they like, I'm taking what's rightfully ours, on behalf of this awesome country. The last two weeks was one hell of a ride. I'm sorry to see it end, but if you're going out, you might as well go out with a bang. I'm having Olympic withdrawals now. Don't know what to do with myself! I'm totally going through Olympic withdrawal. Every day I had a routine. I'd check the schedule, see which events had potential Canadian medalists, and watch. And boy did I watch. 99% of my television viewing the past two weeks was Olympics. And I loved it. I loved the moguls, I loved the snowboarding and ski cross, I loved the speed skating, I loved the figure skating and dance (don't tell anyone), I loved the bobsleigh, I loved the luge and the skeleton, I loved the alpine and aerials and hockey. Man did I love the hockey. How the hell do I go back to watching Leafs games after this? Internationally these were the most shared Winter Games with 26 different countries earning a medal. That's tied with 2006 except that 25th & 26th spot here is for a Silver rather than Bronze medal. Six countries only earned a single podium result last time and three received two medals. For the 2010 Games, there were only three Single medal recipients and one Double medal country are within the complete listing of 26. (plus I posted an Olympics rant). Hey Mike, just catch up on all those DVRed shows... that's how I plan on weening off of the Olympics. I'm glad someone understands my Olympic obsession! I feel so misunderstood! I can admit that my TV never saw anything BUT Olympic events in the last two weeks, even when there were no Canadians with any shot at winning a medal. I remember four years ago, being away in the US visiting my now husband. For a full week, I literally sat in front of his TV for 9 straight hours every single day while he was away at work. Arguably one of the best weeks of my life! Hah. I seriously considered some sick days over the last two weeks, but it turns out being older and more responsible means you feel guilty calling in sick to watch the games. I am still shaking with Canadian pride. The Gold in M&W hockey makes up for the disastrous results in alpine skiing. OTP and Alpine Canada completely failed this country wrt Alpine skiing. The USA completely dominated these events. Alpine Canada is in debt and has nothing to show for it. Total change is needed in the organization if Canada is to recover in the World Cup, and 4 years from now in Russia. I guess Canada did own the podium. We spent a few billion for it but it was ours. Something no one in the media, or in my office has pointed out is that while Canada broke the previous record for gold medals, there are a hell of a lot more events than in the 70s (when the commies had the record)? Even when you compare the total events from the 90s; it stands to reason our chances of winning gold certainly improved. You're like the grinch who stole our Olympic pride. Congratulations, Canada, on all your success. Although yesterday's game was a bitter pill to swallow, I have to admit I was kinda jealous of all the fun you were having. Sorry for bringing reason and common sense into this discussion. I can see it has no place with you. Hey, I wanted Cda to win the gold in hockey - as for the other events, whatever. Look at top ranked teams, based on PERCENTAGE of gold medals won over total events. So on average, the top team wins 22.64% of the medals. There's a standard deviation (+/-) of 5.36%. So a gold medal team SHOULD win between 17.28% and 28% of the medals. Except for 1976 (more than 2 standard devs) and 2006 (still within 2 devs, though), all the teams are performing as well as they should. 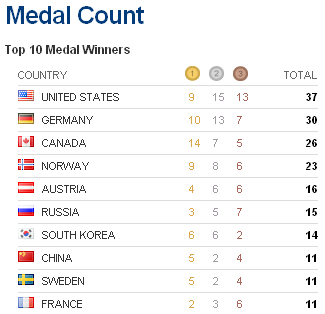 Thus, even taking into account "medal count inflation", Canada played like a champ.